Pottery, one of the oldest and most widespread of the decorative arts, consisting of objects made of clay and hardened with heat. It is one of the oldest human inventions, originating before the Neolithic period. Azerbaijani people have been making pottery for thousands of years. Pottery is known in Azerbaijan since the Bronze Age. Well-equipped pottery workshops were found during excavations in ancient fortresses of the times of Caucasian Albania in the territories of Gabala and Shamkir. The oldest clay kilns were discovered in Mingachevir region. More than 20 different types (churns, pots, jugs, lamps, bowls, vases) of pottery were made in Azerbaijan. From the 9th to the 13th Century, ceramic art was highly developed in Azerbaijan's Karabakh region. Compared to the previous and subsequent periods, the earthenware produced during this period was at a very high level in terms of technique and rich decoration elements. 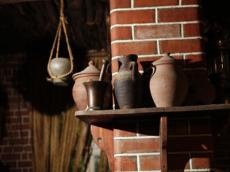 In the late Middle Ages, the production of earthenware products in Karabakh specialized in three large groups - the production of non-enamelware, enamelware and building materials. The group of non-enamelware faience products includes jugs, cauldrons, sehengi (large earthenware jugs for water), bardagi (earthenware jars with a narrow neck), various dishes for milk, buckets, lamps, hookahs, etc. And today in some regions pottery centers continue to operate, where ceramic products are handcrafted. One of the workshops, which cherish the traditions of pottery, is the family enterprise of Jasarat Nuriyev, located in the village of Erkivan, Masalli region. The workshop produces and sells household utensils, including dishes, pots for traditional meat dishes, pitchers, flower pots and so on. In addition to the manufacture of standard products, the master works on the order according to the original client sketches, and also recreates the old ceramic products from the images in the catalogs. According to the hereditary master, whose grandfather and father also engaged in this craft, the production of one product takes from 20 days to two months, since all production is carried out by ancient methods using the potter's wheel and traditional kilns for roasting. So the drying of one product takes about 20 days, after which it is fired in a furnace at a temperature of 1,000 degrees. The pottery products manufactured in this traditional way are environmentally safe and have a high aesthetic value. Potter art will never cease to amaze not only the locals, but also among numerous tourists visiting Masalli.